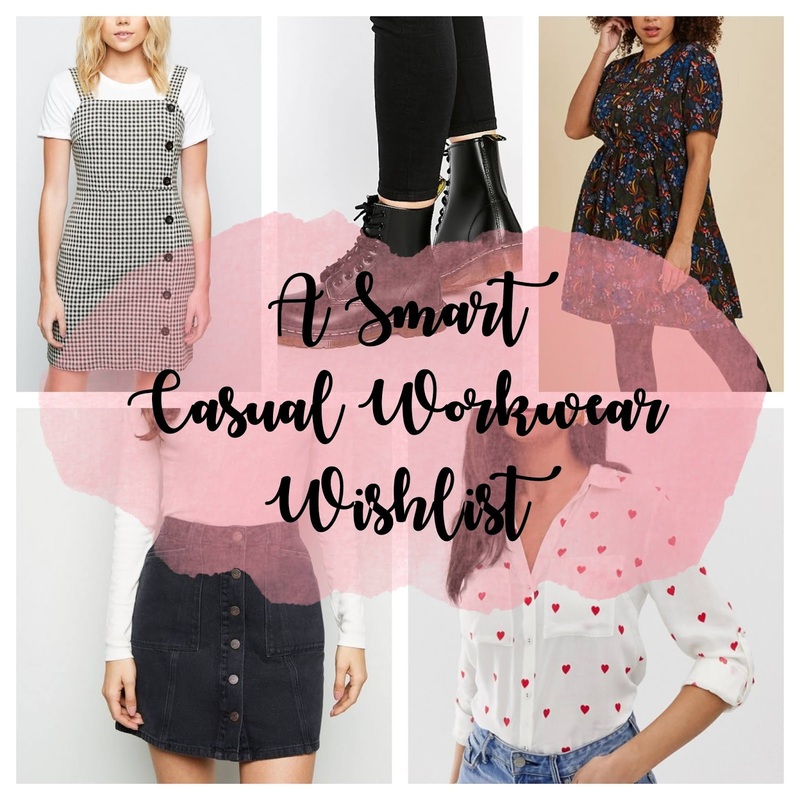 I love doing fashion wishlists on my blog because there's always something I'm interested in buying and I'm always adding items into my favourites or wishlists on various different websites but I thought I'd change it up a little in this post and do a "Smart Casual Workwear Wishlist" instead of my usual fashion wishlists. I feel like a lot of people have different views on what is classed as Smart Casual but this is my take on what I feel is appropriate and within that particular bracket and also share what I would feel comfortable wearing day to day in a workplace environment. I personally think you can't go wrong with a shirt if you're trying to look more professional and smart. But as this post is all about smart casual then the shirt I've chosen to feature in this post is a little more fun than a bog standard white or black shirt. Instead it is white with bright red love hearts scattered all over and I think it would look nice tucked loosely into some jeans with black boots and maybe a blazer to smarten up the look more. I also really like the Fluted Sleeve Smock Dress in Spot Print. I love anything spot printed and I just think it looks cute and also comfortable and I think it would also look great paired with some boots. A chunky knit roll neck jumper like the one above tucked into a printed midi skirt is another smart casual look I personally like the look of and it's a great outfit for the colder months. I really like the ditzy floral print of the New Look midi skirt and I think you could continue wearing the skirt in the Spring and Summer and opt for a t-shirt or shirt instead of the knit jumper. I also love pinafore dresses even though I find it quite hard to find them for my plus size and short 5'2" body. I also have developed a love for leopard print all of a sudden so when I saw the Suedette Leopard Print Pinafore Dress from New Look I had to add to my this wishlist. I just wish I could find one similar in my size! Another item I really like the look of the Topshop Polka Spot Slouch Jumpsuit because it looks so comfortable and I think it'd look really nice with a blazer and boots or sandals depending on the weather and the season. The Sabrina Stripe Colour Top from Joanie would look so nice either tucked into a denim skirt or even some khaki trousers like the ones above from New Look. I personally think stripes, when done correctly, look professional and I really like the peter pan styled collar and tie up collar detailing and I think it makes it look that extra bit smarter. If you want to make a bold statement with your outfit or if you think it looks a little plain then you could add in some animal print boots like the New Look Block Heel Boots above too. Another pinafore dress has made the smart casual wishlist! It's another one from New Look and in a black and white gingham print with side buttoning. I feel like you could size up a dress size and wear a thin knitted jumper underneath for the colder months or wear it with a t-shirt underneath in the Spring so it's seasonally versatile. Again I feel like it would look nice with either boots like some Dr Martens or some comfortable sandals. I also love the look of the Joanie Rosaline Woodland Tea Dress because it's just so pretty and you could style it with a cardigan, a jumper or a blazer. I'm currently a big fan of pale blush pink bags right now too so I had to add the Lipsy bag I came across on ASOS which is the perfect size for work and would tie into Gingham Pinafore Dress/Joanie Woodland Dress outfits nicely. If you feel like you need help to identify your workwear style then you can use Bon Marche's quiz to help you!